The Bowater Motor Group are very pleased to be working with the Brook Sanctuary on their project by providing them with some prime space in the Bowater Honda showroom on Rutherford Street to operate their fund raising office. 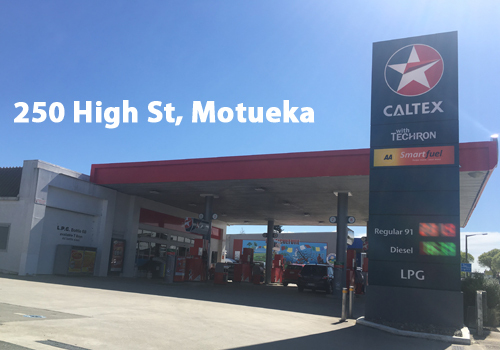 This inner city presence will hopefully make it a little easier for them to raise funds and move closer to the goal of erecting the 14km pest proof fence. This section of the website will be the place where we share news from the Brook Sanctuary team, their progress and opportunities for us all to help this very worthwhile local cause. The Brook Waimarama Sanctuary is a community-based initiative working to create a pest-free wildlife sanctuary close to the Nelson city centre in New Zealand. Integral to creating the Brook Waimarama Sanctuary is construction of a pest-proof fence 14km long, to enclose the area, and to eradicate all the pest mammals within it. This will enable the re-creation of a historic piece of New Zealand which today is only found on a few offshore islands. Resident birds, reptiles and invertebrates will flourish and species previously lost from the area will be re-introduced. 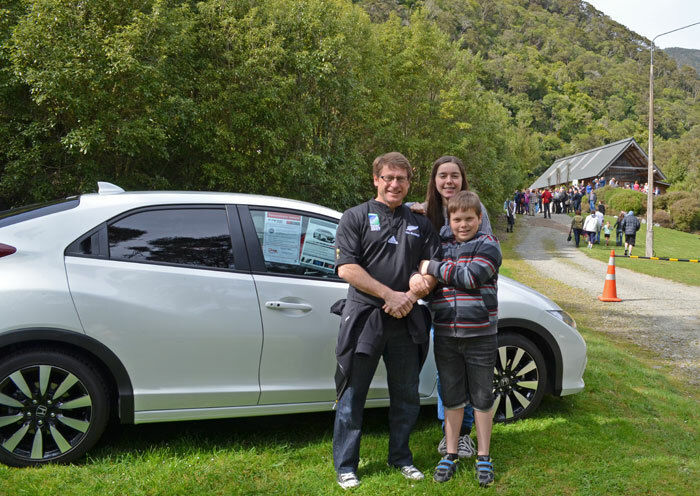 Chris Bowater, along with his two children Jacob and Laura, were very proud to attend last weekend's Brook Waimarama Sanctuary Ground Breaking Ceremony as representatives of Bowater Honda and the wider Bowater Motor Group. 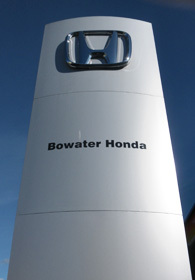 Bowater Motor Group joins in the celebrations of a key project milestone. Last Saturday was a very important day for the Brook Sanctuary, the local wildlife and the local humans of the region. It was a day many thought would be a long way off for a project many had dismissed as being a flight of fancy and way too hard to actually achieve. Imagine convincing many layers of local and national goverance, as well as different funding bodies, locals and various conservation groups of the value of creating a predator free inland island to protect our vulnerable native wildlife from the rigors of modern life and the plethora of introduced pests. Due to the very hard work by the Brook Waimarama Sanctuary Trust team Saturday the 27th of September marked a very important occassion. It was a celebration of the power of great intentions, loads of hard work, and a passionate and dedicated group of individuals determined to see this important project through to eventuality. A celebration for those that have the power to visualise a better world, and setting to rights some of the damage caused by past actions, and then setting about actually achieving it! The ceremony was a key milestone for the project. The chance to finally break ground and sink in the very first fencepost as the construction of the 14km long predator proof fence officially got underway. The Brook Sanctuary are so close to meeting the goals set out right at the start of the project that they are getting into celebration mode. Part of the fundraising cycle for the winter is a jazzy wee music performance at Old St John's on Hardy Street. Part celebration, part fundraiser. A whole lot of fun! 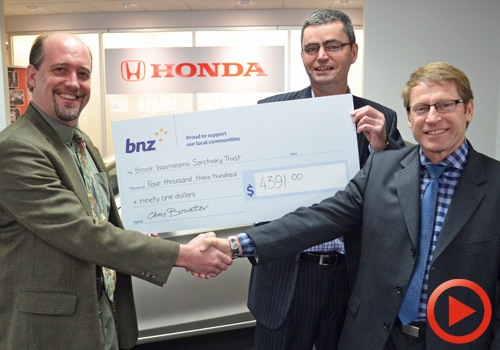 The Bowater Motor Group are always keen to support the Brook Sanctuary whenever and wherever we can, so when this jazz concert idea was discussed the team at Bowater Honda immediately stuck up their hand. 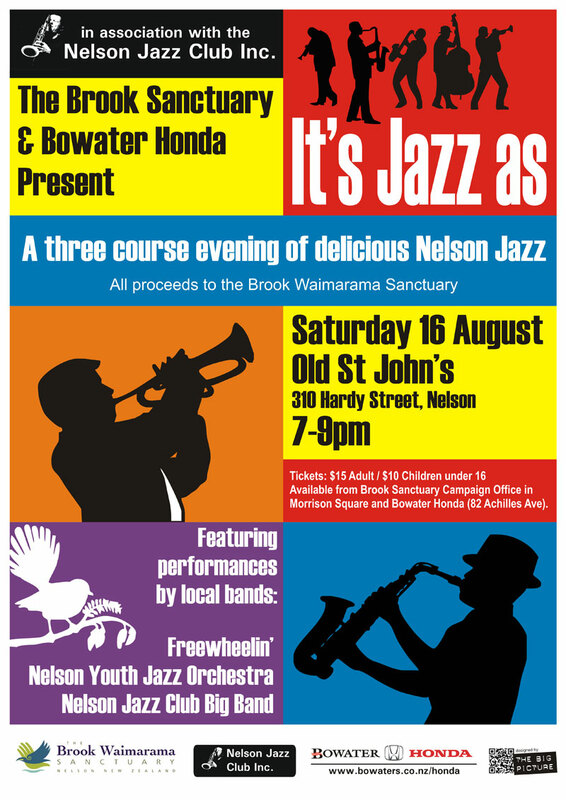 What a great cross over, the brand new bold and colourful Honda Jazz has just been launched - a perfect fit for the Brook Sanctuary Jazz Concert, and so now we have the "It's Jazz As" Concert! Just like the Honda Jazz, tickets are very cheap. Just $15 for adults and $10 for those children under 16. These tickets can be bought at either the Brook Sanctuary office in Morrison's Square, or at Bowater Honda in Achilles Ave.
Keep an eye on our Facebook page (click here) as well - we may just be able to swing a few giveaways! Brook Waimarama Sanctuary critters are popping up all over the place! 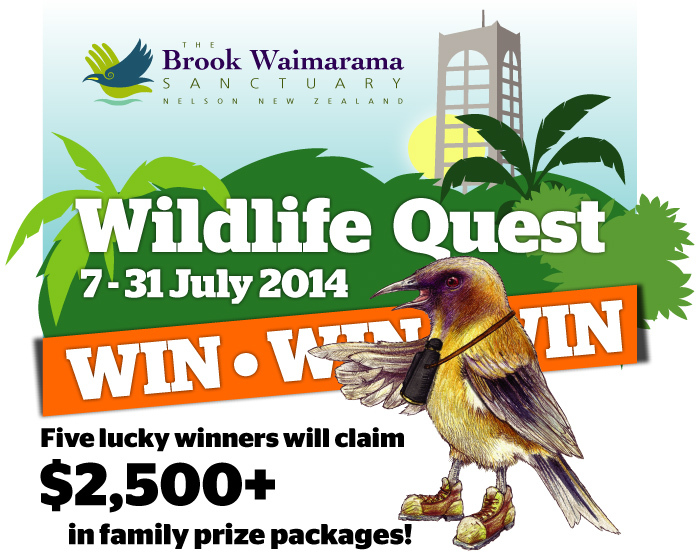 As the school holidays kick off on Monday 7 July, the Brook Sanctuary will launch its “Wildlife Quest”, an activity based competition for kids of all ages that will run until 31 July. Entrants can use either the street address or GPS coordinates to go on a quest to find out which amazing Dean Raybold art panel (see below) is lurking at which Brook Sanctuary supporter business! Winners will be drawn at the Sanctuary’s Celebration Event which will be held at Founder’s Park Energy Centre on Saturday 2 August from 1-4pm and you must be present to win. Five lucky winners will claim $2,500+ in family prize packages! Includes “Giant - Sedona” women’s bicycle, 3 x Samsung Galaxy Tab 3s, “Buller’s Birds of New Zealand” book and loads of vouchers! The Brook Sanctuary has now set up a new campaign office in Morrison Square. We wish them the best of luck and will certainly continue to be vocal and passionate supporters of a wonderful community driven initiative. This Nelson Mail article fills us in on all of the details. 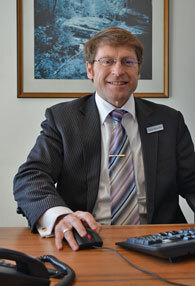 Article by The Nelson Mail. Published 14.01.14. General manager Hudson Dodd and membership administrator Raeonie Thompson at the entrance to the Brook Waimarama Sanctuary's new office in Morrison Square. Photo Credit: Nelson Mail. 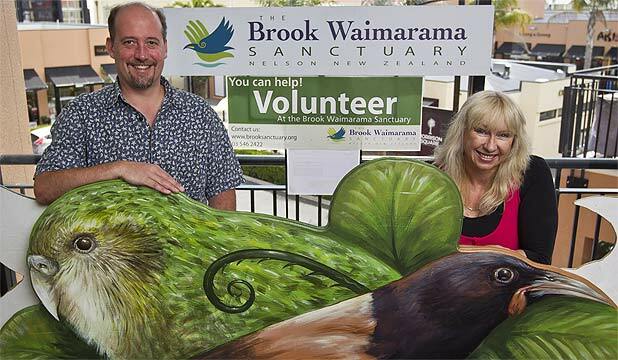 The Brook Waimarama Sanctuary hopes for a boost in fundraising and volunteer sign-ups after moving office to a more visible location in the city. After leaving its old premises at Bowaters due to the showroom being refurbished there the Brook Sanctuary has set up a new base in Morrison Square. The spacious new office, lent to the group for free, will be used as a place for events and recruiting volunteers, and its central location will help increase their visibility. The trust hopes to have a pest-free wildlife area that will be home to various native animals, birds and plants by 2015. Its main fundraising goal is to build a 14-kilometre round pest-proof fence to create a sanctuary for native plants and animals.